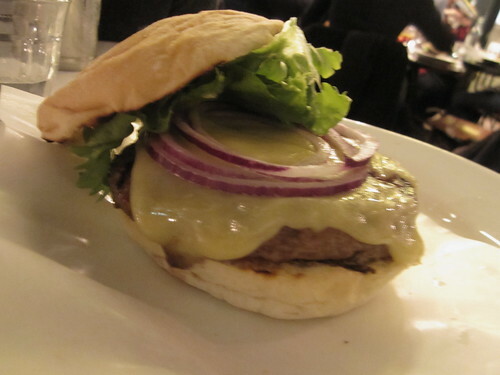 #MEATEASY/The Meatwagon yet (soon, I promise), but London burgers on the whole are not floating my boat. The closest so far (apart from the excellent Hawksmoor, which I’m not counting because no one should have a £15 burger as their default meat patty) though has been Byron. I went to the Soho location on a crisp Friday evening with a few friends before Christmas, eager to see if it lived up to the hype. I like the vibe of Byron. It’s busy, but not rushed. The menu and look of the place is very simple. Classic, almost. I also love that they have a ton of condiments already on the table, including Cholula – one of my favourite hot sauces ever. The burger came out pretty quickly. Nice and pink in the middle, fresh bun, a little sloppy, but definitely good. The fries everyone ordered, however, were nowhere to be seen, and trying to get the attention of our server was quite the task. Eventually, we all received our side dishes, but it did put a damper on the experience – most people were done with their burgers by the time the fries came. So good marks on the burger, not so much on the service. Still, it’s the best burger I’ve had in London for under a tenner, and with 11 locations around the city, if I ever have a craving, I won’t be far away from one! Yes I agree Byron is reliable, I remember when they first opened the poland street branch it was incredible and they had the Big D burger. since opening up all those other chains i feel they’ve spread themselves a little thin and it wouldnt hurt to have a change in sides although the zucchini fries are a favourite!